FDA materials designed to stand up to the toughest corrosives as well as the most sensitive fluids. These filter housings have been designed to meet a burst test of 500 psi and a cycle test of 150,000 cycles from 0 to 125 psi. The standard O-rings are EPDM. 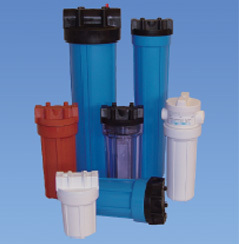 All SPH housings are designed to take standard DOE style cartridges. The SPH housing is the perfect fit when quality and economy are essential.